The timing of the new local initiative coincides with a long-running international tradition. Earth Day is Wednesday, April 22. Available at hope.edu/sustainability-institute, the site features a mix of information, ranging from a comprehensive calendar of community events, to listings of community organizations and resources like the Outdoor Discovery Center and DeGraaf Nature, to suggestions about approaches to spring cleaning. The “Get Involved” section includes suggestions geared toward students and teachers, businesses and community members. The institute is a partnership between the City of Holland, Hope College and the Holland Board of Public Works. Its purpose is to support growing efforts to encourage, engage, educate and drive sustainable culture in water and air quality, energy efficiency, land use and environmental innovation. 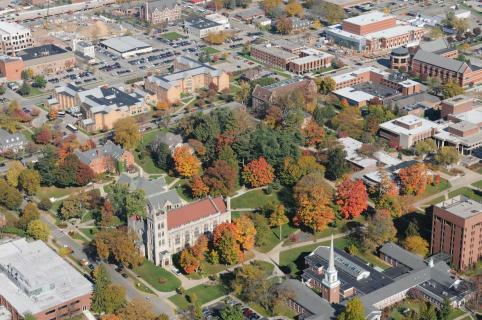 The city and college announced the Holland-Hope College Sustainability Institute in May of 2014, along with a $65,000 grant in support of the project through a national initiative: the Local Sustainability Matching Fund, a project of the Funders’ Network for Smart Growth and Livable Communities, in partnership with the Urban Sustainability Directors Network. The Fund is supported with leadership grants from Bloomberg Philanthropies, JPB Foundation, Kendeda Fund, the John D. and Catherine T. MacArthur Foundation, New York Community Trust, Summit Foundation, and Surdna Foundation. The Fund is designed to catalyze partnerships between local governments and local, place-based foundations and to advance community-based sustainability initiative. The Holland-Hope College Sustainability Institute has also received a three-year grant of $25,000 each year ($75,000 over three years) from the Community Foundation of Holland/Zeeland, in addition to receiving support from the city, Holland Board of Public Works and Hope.